Instagram co-tag graph, highlighting three distinct topical communities: 1) pro-Israeli (Orange), 2) pro-Palestinian (Yellow), and 3) Muslim (Pink). Visualization created from Gephi. If you’re rooting for Israel, you might have seen videos of rocket launches by Hamas adjacent to Shifa Hospital. Alternatively, if you’re pro-Palestinian, you might have seen the following report on an alleged IDF sniper who admitted on Instagram to murdering 13 Gazan children. Israelis and their proponents are likely to see IDF videos such as this one detailing arms and tunnels found within mosques passed around in their social media feeds, while Palestinian groups are likely to pass around images displaying the sheer destruction caused by IDF forces to Gazan mosques. One side sees videos of rockets intercepted in the Tel-Aviv skies, and other sees the lethal aftermath of a missile attack on a Gazan neighborhood. The better we get at modeling user preferences, the more accurately we construct recommendation engines that fully capture user attention. In a way, we are building personalized propaganda engines that feeds users content which makes them feel good and throws away the uncomfortable bits. We used to be able to hold media accountable for misinforming the public. Now we only have ourselves to blame. Not only is there much more media produced, but it is coming at us at a faster pace, from many more sources. As we construct our online profiles based on what we already know, what we’re interested in, and what we’re recommended, social networks are perfectly designed to reinforce our existing beliefs. 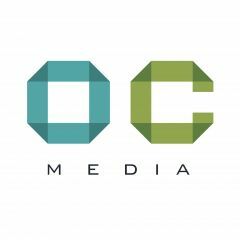 Personalized spaces, optimized for engagement, prioritize content that is likely to generate more traffic; the more we click, share, like, the higher engagement tracked on the service. Content that makes us uncomfortable, is filtered out. We’re not seeing different viewpoints, but rather more of the same. A healthy democracy is contingent on having a healthy media ecosystem. As builders of these online networked spaces, how do we make sure we optimizing not only for traffic and engagement, but also an informed public? As I’m writing this post, details of an Israeli Air Force missile attack near the entrance of a United Nations school in Rafah are emerging. The attack killed at least 10, injuring many more. The IDF claims it had targeted three members of the Islamic Jihad riding a motorcycle near the school, not the school itself. 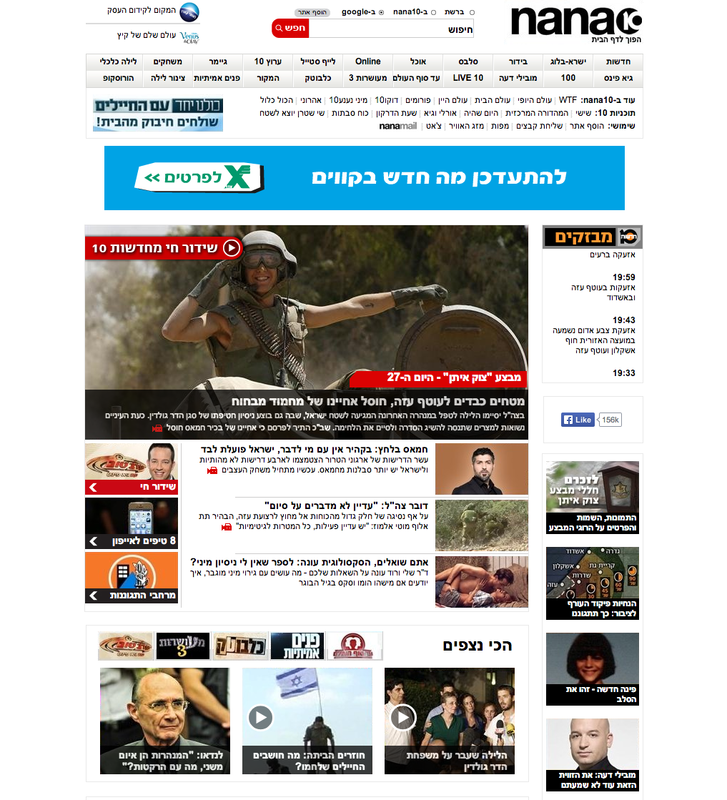 Ynet: “IDF Redeploys Troops, Hamas Shoots 95 Rockets Today”. There’s a minor mention of the incident far below the fold. 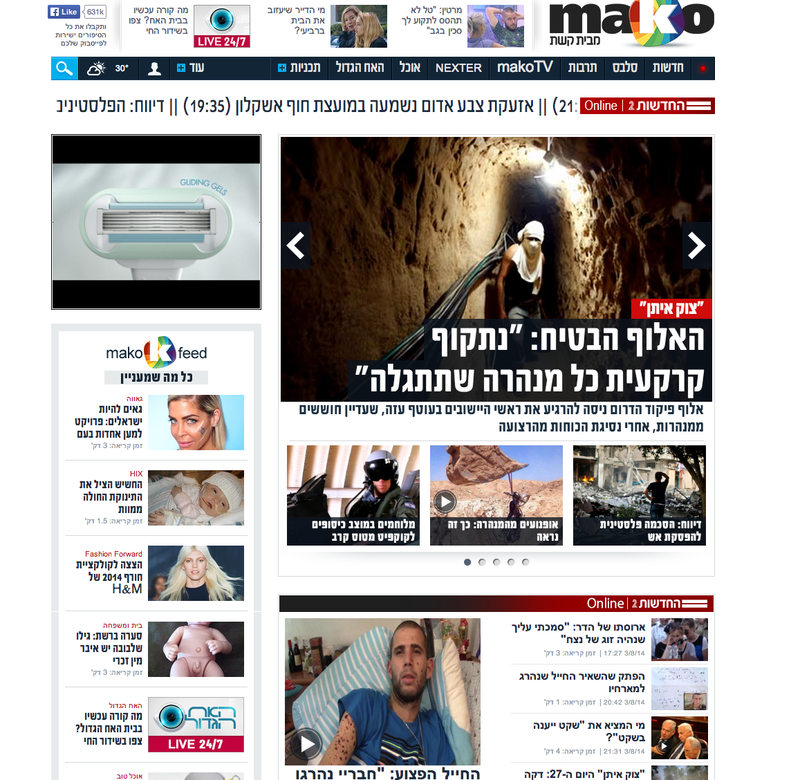 Mako (Channel 2 News): “IDF General: ‘we will go in and destroy every tunnel that we discover’”. Not a single mention of the U.N. school incident. Nana: no mention of the incident. 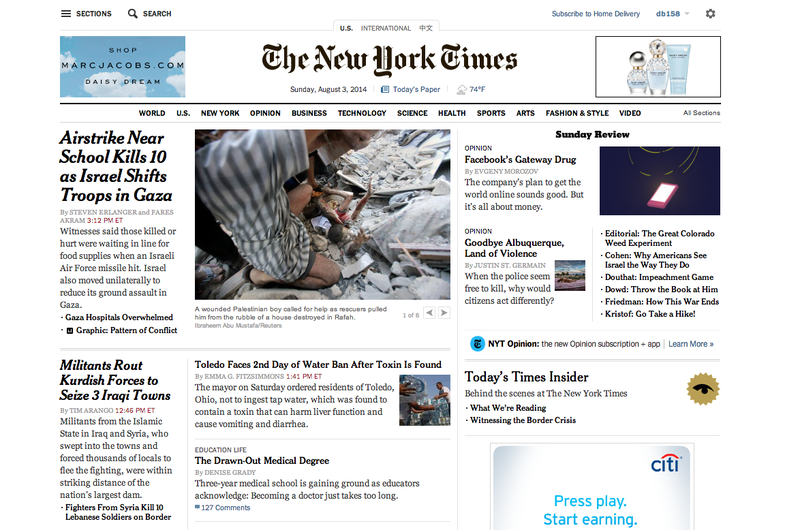 Ha’aretz: leads with an article about the U.N. school attack. 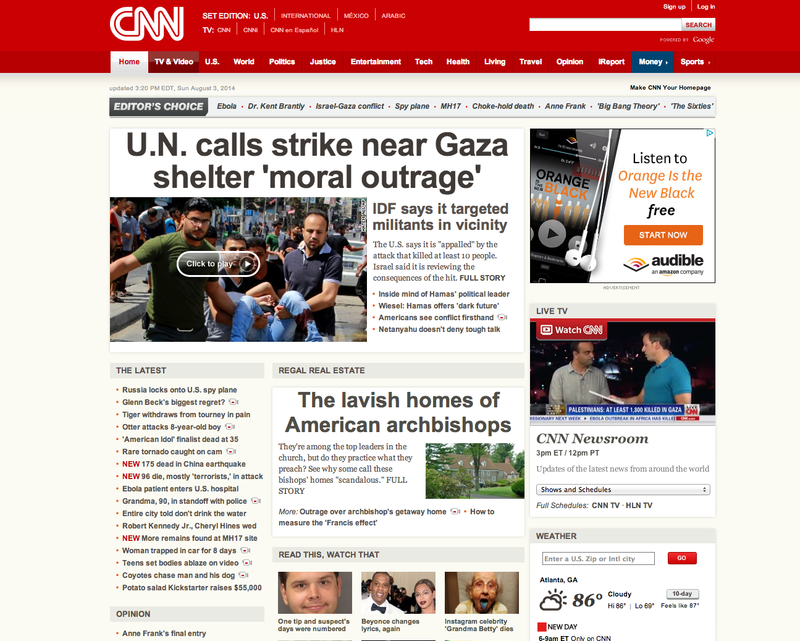 As you can see, there’s almost no mention of the incident across major Israeli media portals. Ha’aretz does cover the story, but Ha’aretz also has less than 10% readership, as it is considered to engender extreme liberal views. 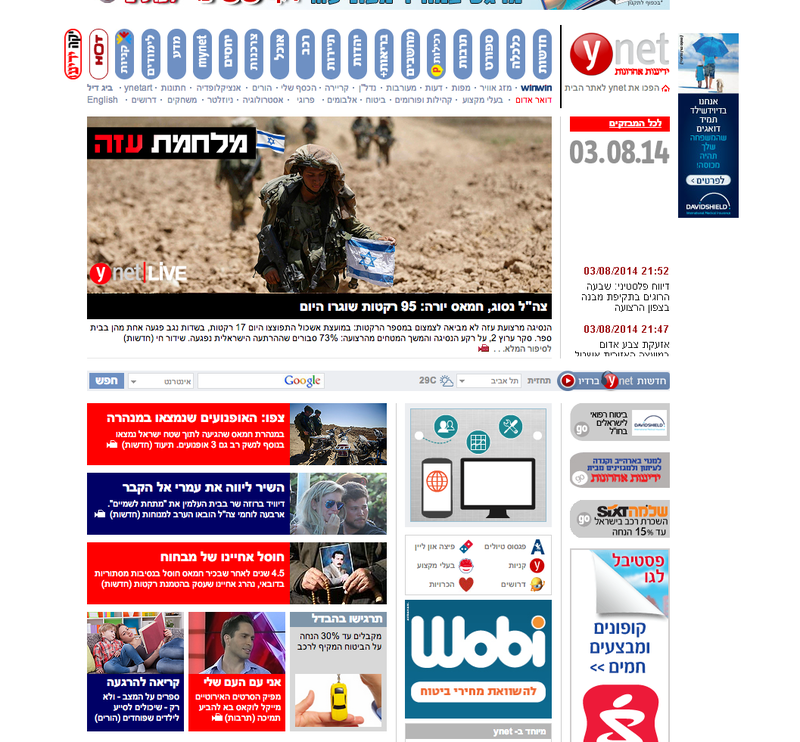 In the fallout of this war, the paper is also losing subscribers angered by published articles critiquing the IDF. Israelis are convinced that media around the world is one-sided, anti-Israeli, and heavily biased towards the Palestinian cause. Yet few come out against their own clearly biased, heavily concentrated and privately owned media (see: Mozes family , Sheldon Adelson). This illustration originally created by Carlos Latuff, a cartoonist, artist and activist based in Rio de Janeiro, Brazil, was heavily shared amongst Israeli users on Facebook over the past month. 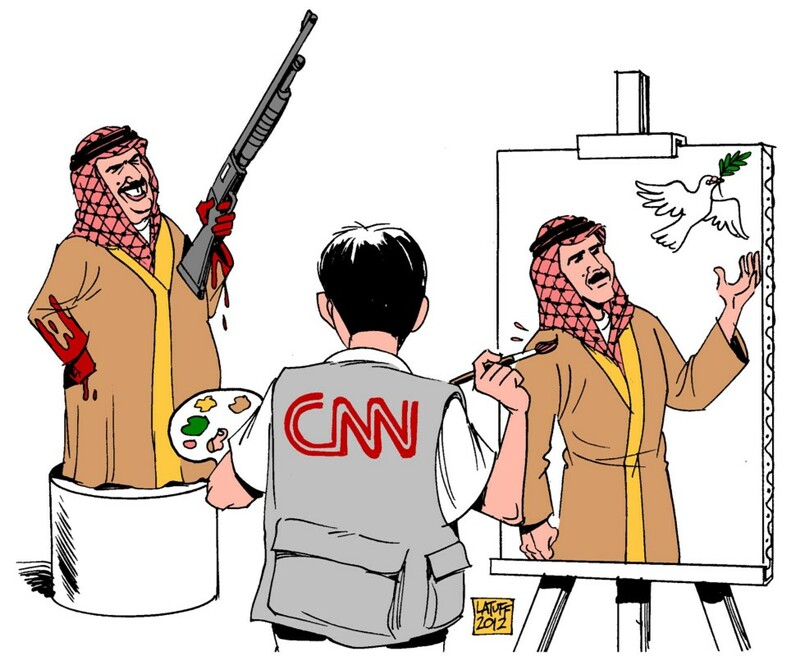 The following illustration, created in 2012 in response to CNN’s whitewashing of Bahrain dictatorship, has been popularly shared across Israeli Facebook pages over the past weeks. It depicts common Israeli sentiment towards western media, as irrational and detached from reality. These very deliberate choices made by media outlets affect our reality, how well we’re informed as a public. Should Israelis show more sympathy towards the U.N. school attack? And if so, who is to blame? … the landscape is much more nuanced, and highly personalized. We construct a representation of our interest by choosing to follow or like specific pages. The more we engage with certain type of content, the more similar content is made visible in our feeds. Recommendation and scoring functions learn from our social connections and our actions online, constructing a model that optimizes for engagement; the more engagement, the more traffic, clicks, likes, shares, and so forth, the higher the company’s supposed value. Our capitalistic markets appreciate a growing value. Facebook plays a key role at disseminating information to the population at large. While some Israelis share news articles in their feeds, many use content sourced by a number of very popular Facebook pages. These are public pages that typically surface funny memes, or buzzfeed-style attention-grabbing images, highly shareable content perfect for Facebook feed-style interactions. StandWithUs (413k likes), an international non-profit organization dedicated to “informing the public about Israel and combating extremism and anti-Semitism” had no mention of the U.N. incident. The same goes for Kikar Hashabat (117k likes) and Tweeting Statuses (605k likes), a heavily followed humor and media curation page. 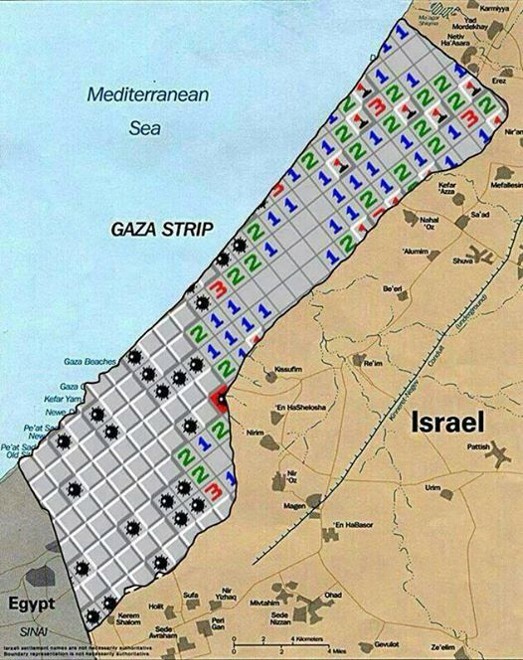 Instead, the following map of the Gaza Strip as a minesweeper grid was posted, with the following comment: “currently spreading on WhatsApp”. The group’s moderator clearly received the image from a WhatsApp group, and posted to this public FB page, which received over 11k likes, hundreds of shares and so far, 133 comments, ranging from critiques to justifications; a highly polarized stream of comments. 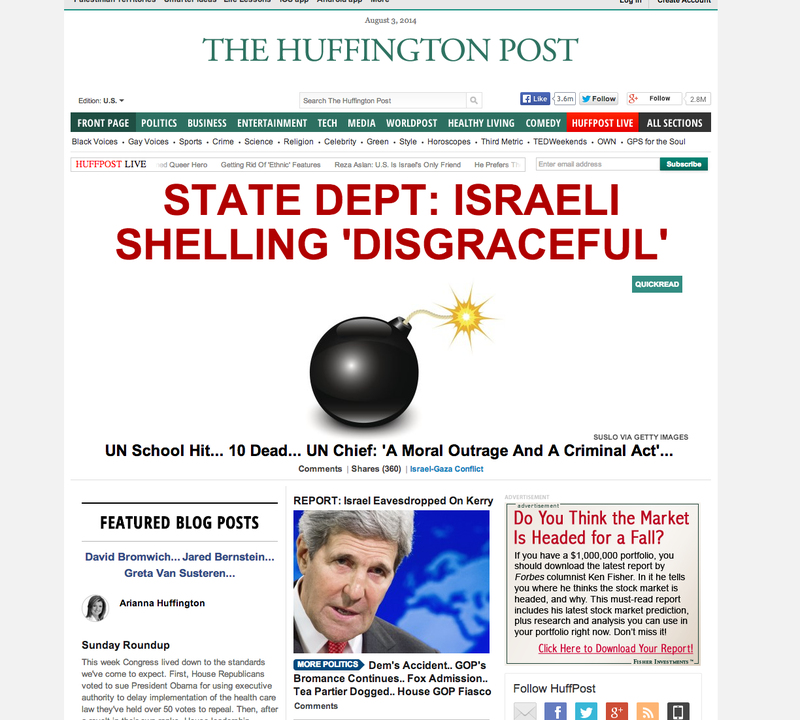 Once again, the Israeli sources had not even a single mention of the U.N. incident. It wasn’t covered by Israeli media, nor was it surfaced through popular Facebook pages. The graph below represents Twitter accounts responding to a different incident at the UNWRA school in Beit Hanoun between July 25th and 30th. 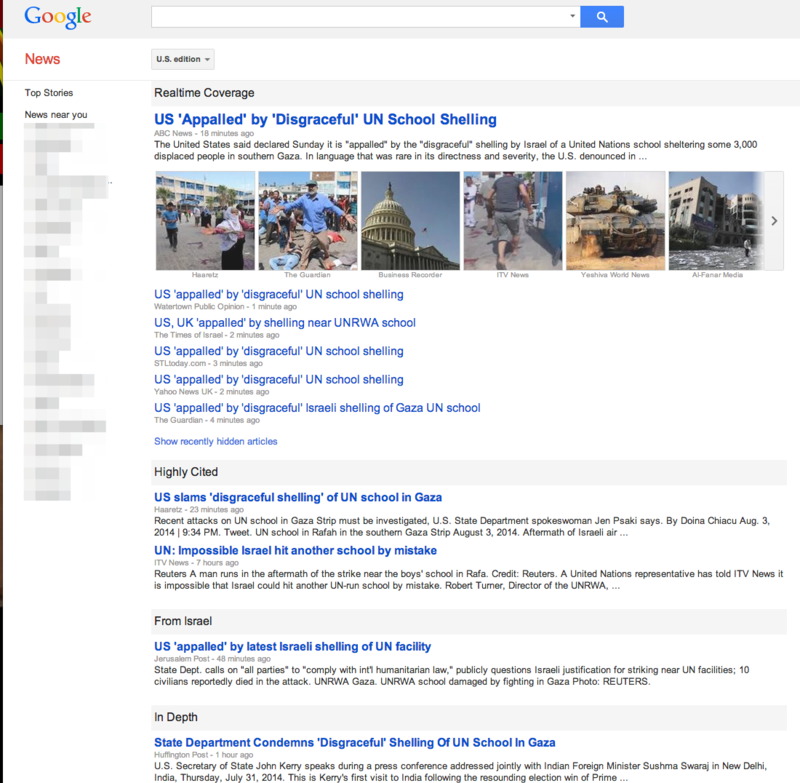 It is still unclear who is to blame for firing at the school, although someone clearly learned their Google SEO tricks (click here to see who comes up first on Google search). Nodes are Twitter handles, and their connections represents who follow relationships. The larger a node, the higher its centrality, the more followed that account is within this group. The closer together two nodes, the more connections they share. Different colors represent communities, effectively regions that display significant levels of connectivity; nodes of the same color are much more inter-connected compared to the rest of the graph. 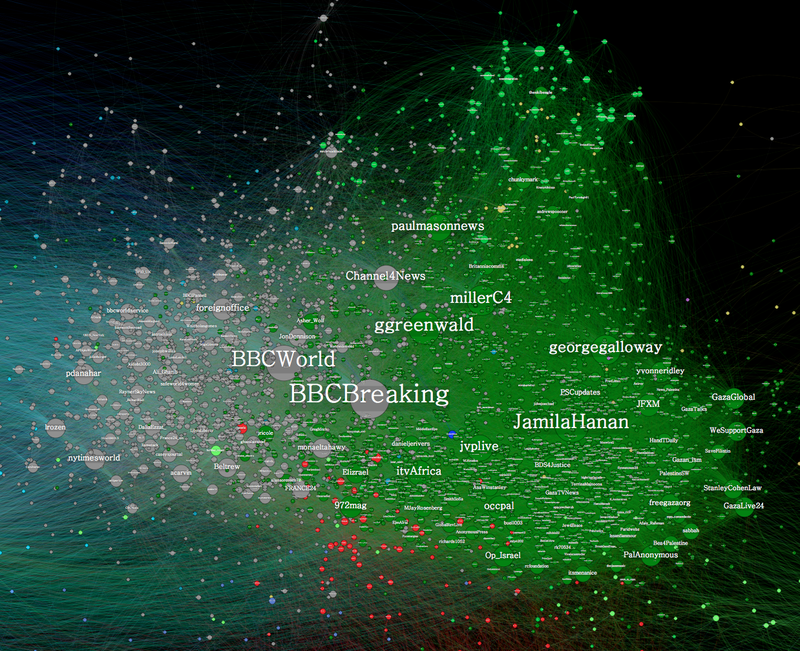 This network graph details the landscape of Twitter handles responding to the UNWRA school bombing. Visualization created from Gephi. Network graphs are mathematical tools used to model relations between objects, and are incredibly helpful when working with social data. Analyzing their structure helps us gain insight into our culture and society. In this case, we see a clear separation between the two sides. On the right, a clearly “pro-Palestinian” group of activists (in green) as well as a variety of media outlets and journalists (in gray). 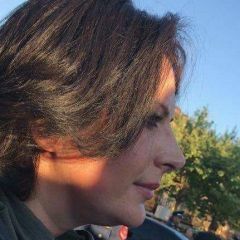 The gray cluster of bloggers, journalists and international media entities is closely connected with the group of pro-Palestinian activists, which means that information is much more likely to spread amongst the two. This structural characteristic of the graph reinforces general Israeli sentiment regarding international media bias. The “pro-Palestinian” side. Visualization created from Gephi. Alternatively, on the other side we encounter the “pro-Israeli” groups, including media outlets, Israeli public personas, and various American zionists (light blue), as well as American conservatives and Tea Party members (dark blue). Pro-Israeli side. Visualization created from Gephi. There’s a clear difference in frame when we compare one side of the graph to the other. None of the information shared is false per se, yet users make deliberate choices about what they choose to amplify. This is a representation of their values, and the values of their connections. Messages passed along in one side of the graph will never reach the other. Certain nodes are more strategic when trying to bridge between the two sides. 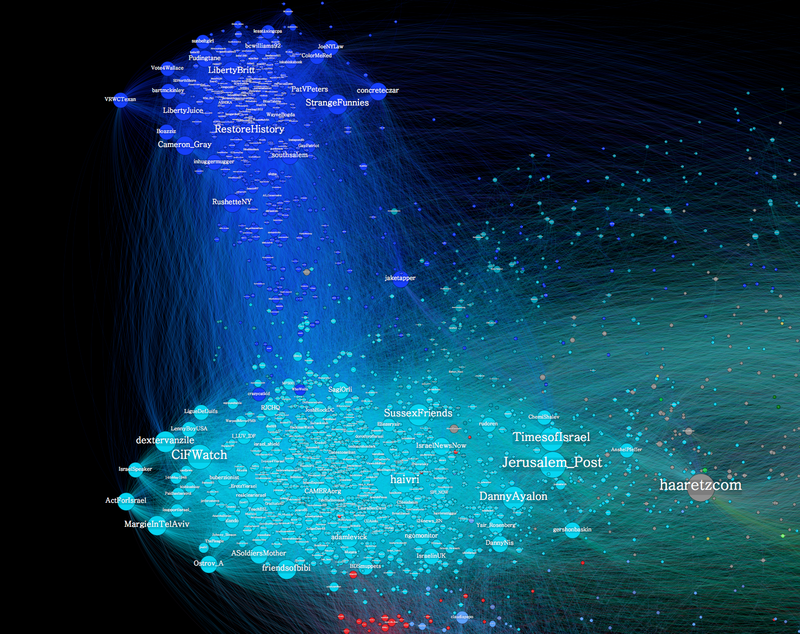 In this case, Haaretz accommodates the most connections on both the pro-Palestinian and pro-Israeli sides of the graph, having the highest betweenness centrality. Compared to all other nodes in the graph, Haaretz is most likely to spread throughout the wider network. It has the most potential for bridging across biases and political barriers. On Instagram we see similar dynamics play out. The language used to describe pro-Israeli content includes tags such as: #IsraelUnderFire#IStandWithIsrael #PrayForIsrael and #Peace. On the other side of the conflict, we see: #FreeGaza, #PrayForGaza, #Genocide and #BoycottIsrael. Content and conversations on Instagram are split into several camps, where once again, we’re effectively all talking to people like us. Call it Homophily, call it the Filter bubble, it is a prevalent phenomenon everywhere we turn. Personalized online spaces are architected to keep us coming back for more. Content that is likely to generate more clicks, or traffic is prioritized in our feeds, while what makes us uncomfortable, fades into the ether. choosing to ‘like’ the Israeli politician Miri Regev produces a list of similar politicians. We construct our social spaces — we may choose to follow a user, like a page or subscribe to updates from a given topic. When we like a Facebook page we are recommended other similar pages (see: collaborative filtering) based on past actions taken by other users on the site. For example, when I chose to follow Miri Regev (left image), a conservative Right-wing Israeli politician, the system recommends other Right-wing Israeli politicians, many of which share her political agenda. The underlying algorithmics powering this recommendation engine help reinforce our values, and bake more of the same voices into our information streams. Facebook’s trending pages aggregate content that are heavily shared (“trending”) across the platform. If you’re already logged into Facebook, you’ll see a personalized view of the trend, highlighting your friends and their views on the trend. Give it a try. Now open a separate browser window in incognito mode (Chrome: File->New Incognito Window) and navigate to the same page. Since the browser has no idea who you are on Facebook, you’ll get the raw, unpersonalized feed. I was surprised to find a relatively sane discussion happening in one social network — Secret.ly, an app that lets you share anonymous messages with your friends. 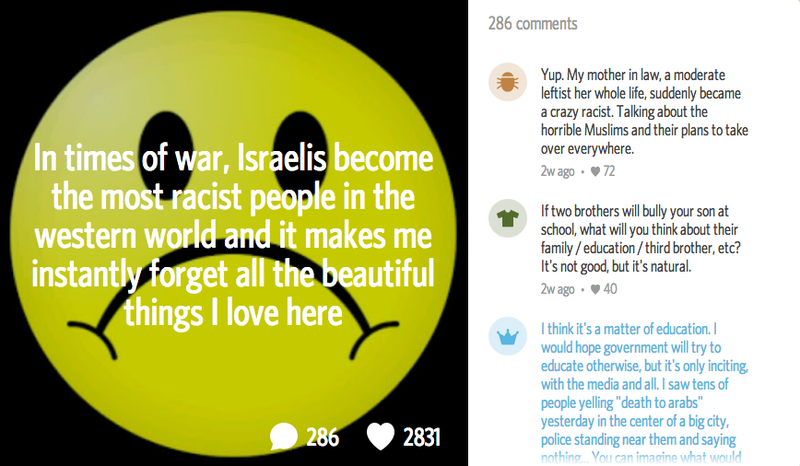 The service published a page with a list of posts about the conflict. I found one of particular interest, not only for the topic, but the actual discussion that unfolded. The combination of anonymity and some proxy for social ties seemed to calm down the typically polarized and extreme tone of conversations. Help make Ha’aretz financially stable by paying for an online subscription(less than $10 per month). 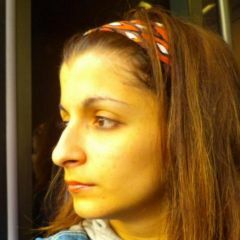 Donate to 972mag.com (and its Hebrew counterpart — Mekomit.co.il), both provide fresh, original, on-the-ground reporting on events in Israel and Palestine, with a strong commitment to human rights and freedom of information. New York City-based Gilad Lotan is the Chief Data Scientist at Beta Works. He's a visualization geek and he writes about data and Middle East politics. You don’t need analysis because you know your truth already: pro-IDF is good, pro-Hamas is bad. Pro Troll is bad, Pro honesty is good. First time I’ve ever been called a troll! Thx! I actually agree with the troll, Ouriel, above. It’s important to filter out bias and false statements like he’s made. Having said that, the author should ignore a troll like Ouriel and I commend the author for providing a data-driven perspective. that makes 2 of you trolls. probably too disturbed to see the reality which is forcing you to hide behind anonymous identities. classic troll. Wait, you have a cartoon character photo and you’re accusing others? Hahahahahahaha. Funny guy. No wonder you’re an expert on trolls…you are the ultimate troll. Brave man show their names. You hide like Hamas does behind their civilians. Mr Jay? a’ight guys – why can’t you have a decent conversation on here? 2. I appreciate your feedback re: qualitative analysis of propaganda on both sides, but that, my friend, is a different post (which you’re more than welcome to publish – i do think it’d be v. interesting). 3. My analysis focused on inherent bias in systems that were supposed to equalize. I wholeheartedly agree that my piece was focused on issues with Israeli media coverage and Israeli social media practices. 100% agree. And that’s partly bc of language, but also bc of coherence. I wanted to make a powerful point, and I think this piece does (been trending everywhere for the past few days). 4. There are many issues on both sides of the conflict. Instead of pointing my finger the other way saying – “they did it too”, would be helpful for us Israelis to reflect on our society, our actions, what we voted into power, and where that’s led us. Jay / WideEyedPup – If you have something to say, then say it. But be respectful. If you’re just here to nag, go somewhere else. I really appreciate the read guys! Great. At least the article put in practice what it speaks about. Not a word about the fake photos of Gaza taken from Hollywood films, or from some other Arabo-arabs conflicts (where the world did not give a damn about the kids. I mean who care about Arabs killing each other. When Jews are involved, it is very different, then you have someone to blame and raise the public attention) Or not a word about news title who from major publications in Europe who did not mention a single time that rockets were also sent from Hamas to Israel. 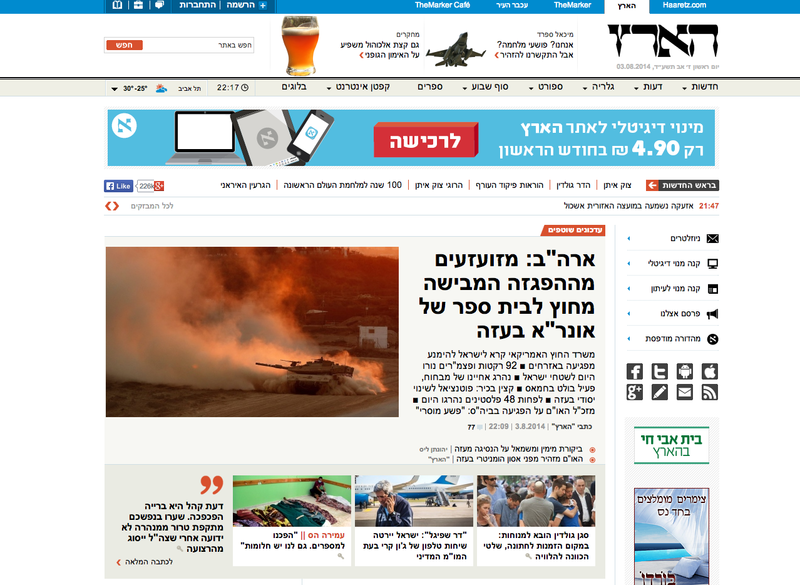 Or, if you are going to bring Israel news title, what about bringing palestinian news titles? or al jazeera news title? Look at what people on Israeli websites are saying – there is hardly a balanced or sane comment among them (in contrast to this discussion).The reality is that most people believe what they want to believe. They are not balanced. In this case it is clear to any objective observer that Israel is the aggressor, and no matter what you think of Hamas, they are resisting that aggression and have the right to do so in the face of overwhelming odds. For Israel to say that Gazans welcome the deaths of their own children as propaganda against Israel is truly sick. This is how much they hate and it clouds their judgement. Israel wants to be part of ‘the west’ and is democratic – for Jews. But it fails a major test. It is a thoroughly racist society and is doomed to failure. Whatever sympathy we had for it is draining away – it’s got nothing to do with Muslems. I’m sure there are some nice Israeli’s – but there’s not much evidence of them on the web. Hi Gilad, great article and research! I would love to do some research myself into Twitter and Instagram. 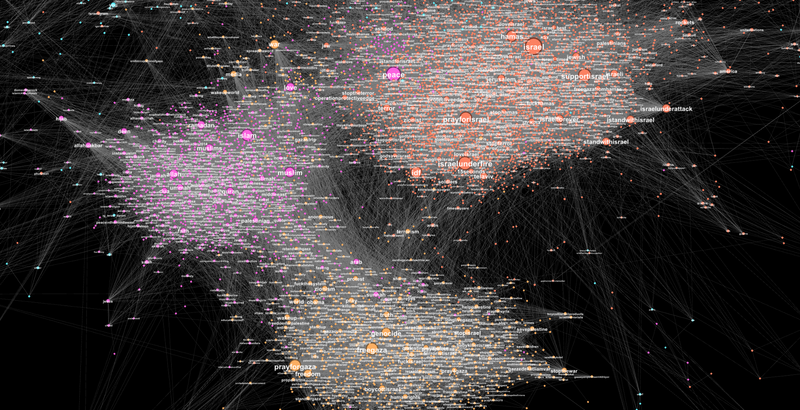 I see you mentioned Gephi as the visualization tool. Now as to the data mining, can you point me towards a beginners guide or give me a little advice about where to start? I have the graph theory and programming covered.